Most Maryland homes are currently without a central vacuum, but the appliance is becoming a more popular staple within the residential community with each day. While a central vacuum hold several benefits for Maryland homes, many homeowners have questions surrounding the appliance. When they are unable to find the answers to their central vacuum questions, they tend to become less inclined to install the appliance. What is the purpose of a central vacuum? A central vacuum works almost like a portable cleaner, but better. The system provides homeowners with cleaner air while also helping the environment and increasing the overall value of the Maryland home. Can a central vacuum be installed in a pre-existing home? 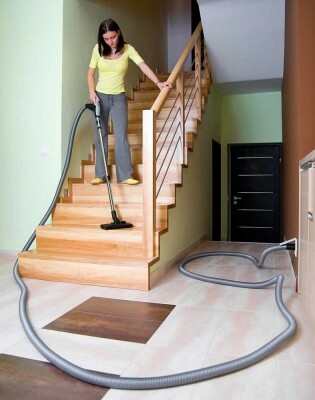 A central vacuum can easily be installed in a completed home without an issue. Major construction isn’t needed, just a small hole will be needed that will then be hidden by the inlet valve of the system. Will I lose power as I move away from the hose source? The main motor of a central vacuum is substantially stronger than a portable vacuum, allowing you to travel throughout your home without losing any suction power. How does a central vacuum work? A central vacuum uses a motor and filter system that is located outside of the home to provide more effective cleaning for your Maryland residence. Instead of moving an entire appliance, you simply move around your home with a lightweight hose to remove dust and debris from your home. The materials are then sent to a filter located in your garage or basement to eliminate the allergens from the air. Will a clog become a major issue? Like with a portable vacuum, it is only natural for larger objects like toys to be sucked up through the hose of your central vacuum. On these occasions, the object only gets as far as the hose, which prevents a clog. Should a clog occur, reversing the flow of suction and other simple maintenance can help remove the clog easily and quickly. Integrated Technologies Group has been providing the residents of Maryland with quality central vacuum systems for over a decade. Along with offering a central vacuum system for your Maryland home, we also offer home theater services, home security services, and home automation services. Integrated Technologies Group now provides the states of Maryland, Pennsylvania, Virginia, Delaware, and West Virginia with home security systems. Want to get started with Integrated Technologies Group? Call us today at 1-800-560-3280 or visit our online contact. We will find the location closest to your home to ensure you receive efficient and quick service. Follow the official Integrated Technologies Group page on Google+, Pinterest, Twitter, and Facebook. Click “Like” and “Follow” today! This entry was posted on Thursday, January 29th, 2015	at 4:00 pm	and is filed under Central Vacuum, ITG, Services Offered	. You can follow any responses to this entry through the RSS 2.0	feed. Both comments and pings are currently closed.